Why have only one heart when you can have three? This 1/4 Carat Triple-Heart Diamond Heart Necklace features a beautiful gold pendant artistically designed to create a sense of three hearts merging into one. This is a wonderful gift as a symbol of love and it is also popular for families of three. This piece has a unique display of hearts that appear to be tumbling together when they are actually fused together with gold. One half of each heart is polished to a perfect 10K white-gold finish, while the other half is set with round-cut white diamonds (0.30 t.c.w.). The polished precious metal mixed with the diamonds makes for a glimmer gold necklace. This triple-heart diamond necklace is an fun and original-looking piece with soft edges and shimmering diamonds that is sure to please that special person who is lucky enough to receive it as a gift of love. 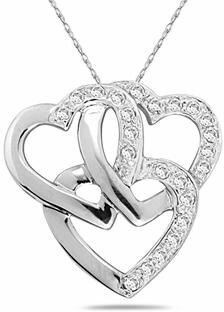 We guarantee our 1/4 Carat Triple Heart Diamond Heart Necklace to be high quality, authentic jewelry, as described above.